Looking for a great activity to entertain your kids and learn about our gardens, parks and streets? Look no further than the Halifax Regional Municipality Urban Biokit. Through its pages, participants can explore the sights, sounds and smells that can be found among the parks, streets and points of interest in HRM, including sections on the Halifax Public Gardens. Copies of the Urban BioKit are available in both English and French at Horticultural Hall. Just ask one of the volunteers at The Friends of PG desk. Click to view the Halifax Public Garden Biokit circuit. All activities are specific to the Gardens and will keep your kids happy and engaged while you get to smell the roses. 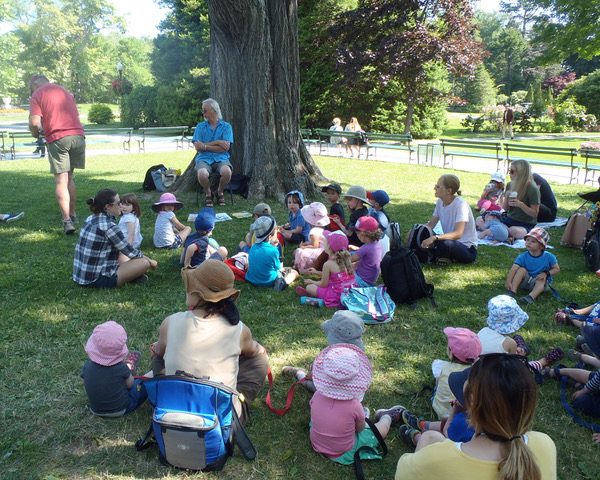 Story Time for kids takes place twice a week (when the Gardens are open for the season) compliments of the Uncommon grounds Cafe and Woozles Books. For dates and times check our Events Calendar.